For the past eight years, the Back Alley Party has provided live music with WoodRiverValley musicians on Wednesday evenings at the Wicked Spud in Hailey. The concerts, organized by Figg/Glyph Productions in association with Heidi Albrecht’s Heidiglyphics and Dana DuGan’s Figgleaf Productions, are free live music concerts, which benefit WoodRiverValley nonprofits. They begin this evening, June 22, from 6:30-9 p.m. Tonight’s show will include opening band Cow Says Moo for All Nite Diner to benefit the BlaineCountyMuseum. DuGan said the Back Alley Party gives back to the community monetarily with entertainment. Beneficiaries include the EnvironmentalResourceCenter, Sun Valley Adaptive Sports, Northern Rockies Folk Festival and several other well-known WoodRiverValley nonprofits. The concerts will continue every Wednesday, through Aug. 31. A raffle will take place every week. Raffle tickets are $1 or 6 for $5, 12 for $10 and 25 for $20. Donations for raffle items can be dropped off at the Wicked Spud for Albrecht. Proceeds from the Wednesday evening event have been as much as $3,000 a year for local nonprofits. The Back Alley Party is a family-friendly event and children are welcome. · June 22 will benefit the BlaineCountyMuseum with music by Cow Says Moo opening for All Nite Diner. · June 29 will benefit the EnvironmentalResourceCenter with music by Good JuJu’s opening for Hanger 17. · July 6 will benefit Sun Valley Adaptive Sports and the Blaine County Education Foundation with music by Hoodwink. · July 20 will benefit the Northern Rockies Folk Festival with music by the Kim Stocking Band. · July 27 will benefit the Wood River Land Trust with music by Finn Riggins. · Aug. 3 will benefit Camp Rainbow Gold with music by Johnny V and the Wingmen. 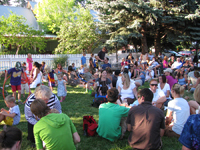 · Aug. 10 will benefit Idaho’s Bounty and Souper Supper with music by Hat Trick opening for Slow Children Playing. · Aug. 17 will benefit the Wood River Hospice with music by King Louis and the Chaperones. · Aug. 24 will benefit Mountain Rides and the season end of the Smart Moves program with music by Tom Archie opening for Str8Up. · Aug 31 will benefit Wood River Fire & Rescue with music by Back Pedal opening for the 812 Band.